My Boss – he is a great person to work with. Lots of energy and an excellent teacher indeed. Not to forget the constant urge to eat! Next Door Canteen – the lovely food it served us was something to relish. The big spacious office – Nah, my new office not so big. 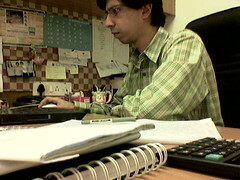 My cubicle – My own private work space. My IBM Thinkpad – the perks go with the job. My Mobile – An all paid company provided cell-phone. Ehhhhhhhhhhhhh! But I look forward to some great time in my new work. Wish me luck!